english name "Japanese Ringed-Bulb Amanita"
intro The following is based on the original description of Amanita ibotengutake (Oda et al. 2002). cap The cap is 75-160 mm wide, hemispherical at first, then convex to plane, often eventually with an uplifted margin, brown to dark brown to yellowish or orangish brown, often darkest in the center, and smooth. The striations on the cap margin have lengths up to 30% of the cap's radius. The cap flesh is white and 6-8 mm thick above the stem. The volval remnants on the cap are pallid pyramidal warts or small patches. gills The gills of this species are free to remote, 9-15 mm broad, white to pale cream, crowded, and have a pruinose free edge. The short gills are truncate to subtruncate in 1-6 ranks. stem 55 - 160 × 9 - 24 mm, white to yellowish white to pale yellow, narrowing upward, and hollow to stuffed. The stem's basal bulb is 30 - 40 × 14-36 mm and globose or subglobose or broadly ellipsoid or ellipsoid or spindle-shaped. The stem bear a median skirt-like ring that is sometimes torn away during expansion of the mushroom and may remain hanging from the cap's margin. The volval remnants on the top of the stem's bulb make up several rather closely packed whole or broken [white or whitish] rings. odor/taste Fresh specimens are said to have an odor similar to "resin." spores The spore measurements are as follows: (8.0-) 8.4 - 10.8 (-12.0) × (5.6-) 6.4 - 8.0 (-10.0) μm. The spores are broadly ellipsoid to ellipsoid (infrequently subglobose or elongate) and inamyloid. Clamps are commonly present at bases of basidia. discussion The authors claim the species is segregatable from A. subglobosa Zhu L. Yang by molecular means. author T. Oda et al. 2002. Mycol. Progress 1(4): 355-356. 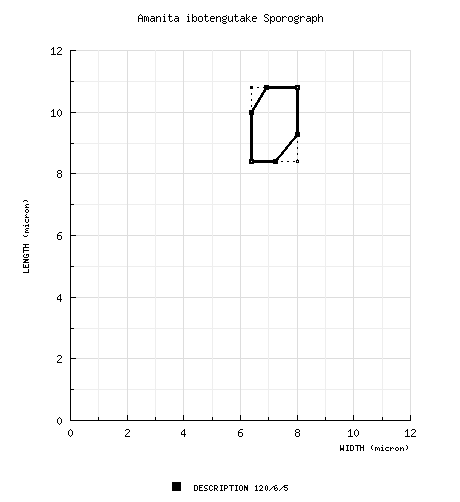 AB095848 beta-tubulin 5.x.2000 T. Oda s.n. (holotype, CBM FB-30969) T. Oda Yamazaki et al. (2002), Lab. Env. Mycosci., Grad. School Agric., Kyoto Univ. AB095846 beta-tubulin 30.vi.2001 Y. Andou s.n. (paratype, CBM FB-30966) T. Oda Yamazaki et al. (2002), Lab. Env. Mycosci., Grad. School Agric., Kyoto Univ. AB088767 nrLSU 18.viii.1997 Y. Nishihara s.n. [LEM 970678] (paratype, CBM FB-30974) T. Oda Yamazaki et al. (2002), Lab. Env. Mycosci., Grad. School Agric., Kyoto Univ. AB080985 nrITS 30.vi.2001 Y. Andou s.n. (paratype, CBM FB-30966) T. Oda Yamazaki et al. (2002), Lab. Env. Mycosci., Grad. School Agric., Kyoto Univ. AB080986 nrITS 30.viii.1997 K. Kudo [LEM 970669] (paratype, CBM FB-30967) T. Oda Yamazaki et al. (2002), Lab. Env. Mycosci., Grad. School Agric., Kyoto Univ. AB080987 nrITS 11.vii.1999 T. Oda s.n. [LEM 991009a] (paratype, CBM FB-30968) T. Oda Yamazaki et al. (2002), Lab. Env. Mycosci., Grad. School Agric., Kyoto Univ. AB080989 nrITS 5.x.1997 T. Hashimoto s.n. (paratype, CBM FB-30970) T. Oda Yamazaki et al. (2002), Lab. Env. Mycosci., Grad. School Agric., Kyoto Univ. AB080990 nrITS 22.ix.2000 Y. Andou (paratype, CBM FB-30971) T. Oda Yamazaki et al. (2002), Lab. Env. Mycosci., Grad. School Agric., Kyoto Univ. AB080991 nrITS 21.iii.1997 Y. Nishihara s.n. [LEM 970662] (paratype, CBM FB-30972) T. Oda Yamazaki et al. (2002), Lab. Env. Mycosci., Grad. School Agric., Kyoto Univ. AB081291 nrITS 15.vii.1997 S. Sakai s.n. [LEM 970680] (paratype, CBM FB-30973) T. Oda Yamazaki et al. (2002), Lab. Env. Mycosci., Grad. School Agric., Kyoto Univ. AB081292 nrITS 18.viii.1997 Y. Nishihara s.n. [LEM 970678] (paratype, CBM FB-30974) T. Oda Yamazaki et al. (2002), Lab. Env. Mycosci., Grad. School Agric., Kyoto Univ. AB081293 nrITS 31.x.1995 T. Oda s.n. [LEM 950167] (paratype, CBM 30975) T. Oda Yamazaki et al. (2002), Lab. Env. Mycosci., Grad. School Agric., Kyoto Univ. AB081297 nrITS 3.xi.1998 poisoning victim in emergency hospital (Osaka Senri Kyumei Kyukyu Center) s.n. (paratype, CBM FB-30979) T. Oda Yamazaki et al. (2002), Lab. Env. Mycosci., Grad. School Agric., Kyoto Univ. AB095847 beta-tubulin 11.vii.1999 T. Oda s.n. [LEM 991009a] (paratype, CBM FB-30968) T. Oda Yamazaki et al. (2002), Lab. Env. Mycosci., Grad. School Agric., Kyoto Univ. The following material is derived from the protolog of the present taxon. pileus from protolog: 75 - 160 mm wide, brown to dark brown to yellowish brown to brownish orange (5C4-5, 5D-F4-8, 6E-F5-8), often darker over disc and paler toward margin, at first hemispheric, then convex to planar, smooth; context white, 6 - 8 mm thick over stipe; margin striate (0.1 - 0.3R), often upturned, "sometimes appendiculate"; universal veil as pyramidal warts (up to 1 × 1 - 3 mm) or (sometimes) small patches. lamellae from protolog: free to remote, crowded, white to pale cream, 9 - 15 mm broad, with pruinose edge; lamellulae truncate to subtruncate in "1 - 6 ranks." stipe from protolog: 55 - 150 × 9 - 24 mm, white to yellowish white to pale yellow (3A1-3), narrowing upward, pruinose above, scaly to fibrillose below; bulb 30 - 40 × 14 - 36 mm, globose to subglobose to broadly ellipsoid to ellipsoid to fusiform; context hollow to stuffed; partial veil median, membranous, fragile, sometimes remaining in fragments on pileus margin; universal veil as several whole to irregularly broken ascending rings on lower stipe and upper bulb. odor/taste from protolog: Odor slightly of resin in fresh material. Taste not recorded. pileipellis from protolog: suprapellis ca. 80 - 200 μm thick, gelatinized, colorless to slightly brownish; subpellis ca. 140 - 250 μm thick, [?ungelatinized ,] slightly brownish; filamentous hyphae 1 - 5 μm wide, branching, interwoven to subradial; vascular hyphae 3 - 6 μm wide; clamps "usually" present. subhymenium from protolog: "ramose-inflated," ca. 15 - 35 μm thick; inflated cells "usually" in 1 - 3 layers, globose to subglobose to broadly ellipsoid to ellipsoid to elongate to cylindric to pyriform to doliiform to ovate to clavate to irregularly shaped, 6 - 22 × 5 - 20 μm. basidia from protolog: 40 - 53 × 10 - 14 μm, 4-sterigmate, with sterigmata 2 - 7 μm long; clamps "usually" present. universal veil from protolog: On pileus: filamentous hyphae 2 - 8 μm wide, branching, interwoven; inflated cells abundant, globose to subglobose to broadly ellipsoid to ellipsoid to elongate to cylindric to fusiform to clavate to sphaeropedunculate to pyriform, 20 - 55 × 13 - 35 μm, terminal singly or in short chains; vascular hyphae 2 - 20 μm wide; clamps "often" present. On stipe base: filamentous hyphae 2 - 8 μm wide, dominant, branching, interwoven, densely packed; inflated cells globose to subglobose to broadly ellipsoid to ellipsoid to ovate to clavate to pyriform to fusiform, 20 - 100 × 15 - 55 μm, terminal singly; vascular hyphae 3 - 8 μm wide; clamps "often" present. stipe context from protolog: longitudinally acrophysalidic; filamentous hyphae 2 - 10 μm wide, branching; acrophysalides 110 - 480 × 20 - 60 μm; vascular hyphae rare; clamps "usually" present. In stuffing of central cylinder, filamentous hyphae 2 - 13 μm wide dominating; inflated cells globose to subglobose to broadly ellipsoid to ellipsoid to elongate to ovate to clavate to sphaeropedunculate, 25 - 90 × 12 - 45 μm, terminal singly: vascular hyphae 3 - 14 μm wide; clamps "usually" present. partial veil from protolog: filamentous hyphae dominating, 1 - 10 μm wide, branching, interwoven, densely packed; inflated cells ellipsoid to fusiform to clavate to cylindric-clavate, 24 - 120 × 9 - 35 μm, terminal singly; vascular hyphae 2 - 15 μm wide; clamps "usually" present. lamella edge tissue not described. from protolog: [120/6/5] (8.0-) 8.4 - 10.8 (-12.0) × (5.6-) 6.4 - 8.0 (-10.0) μm, (Q = (1.08-) 1.16-1.56 (-1.73); Q' = 1.33 ± 0.12, hyaline, smooth, inamyloid, broadly ellipsoid to ellipsoid, sometimes subglobose or elongate, often adaxially flattened (per figure); apiculus sublateral and cylindric (both per figure); contents not described; color in deposit not recorded. ecology from protolog: Solitary to gregarious. Hokkaido: At ca. 200 - 400 m elev. In plantation of Abies sachalinensis. Honshu: At ca. 10 - 140 m elev. In mixed forest with Quercus serrata and Pinus densiflora or in forest of P. densiflora or in beach forest of P. thunbergii or under Lithocarpus edulis or in plantation of Tsuga. material examined from protolog: JAPAN: HOKKAIDO—Abuta-gun - Rusutsu-mura [ca. 400 m], 21.iii.1997 Y. Nishihara s.n. [LEM970662] (paratype, CBM FB-30972); Toyoura-cho, Shinyamanashi [ca. 200 m], 18.viii.1997 Y. Nishihara s.n. [LEM 970678] (paratype, CBM FB-30974). HONSHU—Aomori-ken - Aomori-shi, Sukimino [ca. 10 m], 30.viii.1997 K. Kudo [LEM 970669] (paratype, CBM FB-30967). Kyoto-fu - Kyoto-shi, Kita-ku, Kamigamo, Kamigamo Experimental Forest, 31.x.1995 T. Oda s.n. [LEM 950167] (paratype, CBM 30975); Kyoto-shi, Sakyo-ku, Kaguraoka-cho, Mt. Yoshida [ca. 100 m], 11.vii.1999 T. Oda s.n. [LEM 991009a] (paratype, CBM FB-30968), 5.x.2000 T. Oda s.n. (holotype, CBM FB-30969). Miyagi-ken - Shida-gun, Matsuyama-cho, Mt. Takatera [ca. 140 m], 22.ix.2000 Y. Andou (paratype, CBM FB-30971); Sendai-shi, Fukanuma Beach, 30.vi.2001 Y. Andou s.n. (paratype, CBM FB-30966). Niigata-ken - Niigata-shi, campus of Niigata Univ., 15.vii.1997 S. Sakai s.n. [LEM 970680] (paratype, CBM FB-30973). Osaka-ken - unkn. loc., 3.xi.1998 poisoning victim in emergency hospital (Osaka Senri Kyumei Kyukyu Center) s.n. (paratype, CBM FB-30979); Hirakata-shi, Kourigaoka, 5.x.1997 T. Hashimoto s.n. (paratype, CBM FB-30970). 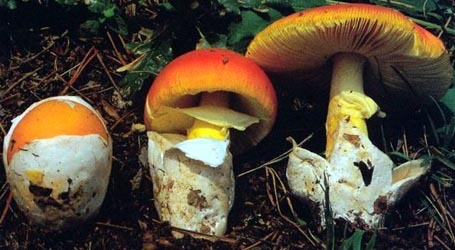 discussion from protolog: The species contains muscimol and ibotenic acid; the name of the latter was derived from the Japanese name for this species when the species was mistakenly believed to be assignable to Amanita pantherina. The authors point out that this is clearly an error on both morphological and phylogenetic grounds. The rather common clamps in the present species indicate that it must be classified in series Amanita on morphological evidence alone. The authors suggest two taxa as most closely related to the present species—A. regalis and A. subglobosa. select a collection to review/add spore measurements..#785200. Y. Nishihara, #s.n.=>LEM970662, JAPAN, HOKKAIDO, Abuta-gun, Rusutsu-mur..#785201. Y. Nishihara, #s.n.=>LEM 970678, JAPAN, HOKKAIDO, Abuta-gun, Toyoura-ch..#785202. K. Kudo, #s.n.=>LEM 970669, JAPAN, HONSHU, Aomori-ken, Aomori-shi, Suki..#785203. T. Oda, #s.n.=>LEM 950167, JAPAN, HONSHU, Kyoto-fu, Kyoto-shi, Kita-ku,..#785204. T. Oda, #s.n.=>LEM 991009a, JAPAN, HONSHU, Kyoto-fu, Kyoto-shi, Sakyo..#785205. T. Oda, #s.n., JAPAN, HONSHU, Kyoto-fu, Kyoto-shi, Sakyo-ku, Kagurao..#785206. Y. Andou, #s.n.=>ca. 140 m, JAPAN, HONSHU, Miyagi-ken, Shida-gun, Matsu..#785207. Y. Andou, #s.n., JAPAN, HONSHU, Miyagi-ken, Sendai-shi, Fukanuma Beach#785208. S. Sakai, #s.n.=>LEM 970680, JAPAN, HONSHU, Niigata-ken, Niigata-shi, c..#785209. poisoning victim in emergency hospital, #s.n., JAPAN, HONSHU, Osaka-ken..#785210. T. Hashimoto, #s.n., JAPAN, HONSHU, Osaka-ken, Hirakata-shi, Kourigaoka..